Thanks to Roger Govier, who created this tutorial and workbook. How many unique (distinct) customers made purchases in each region? How many unique products were sold in each store? How many unique salepeople sold each product per region? 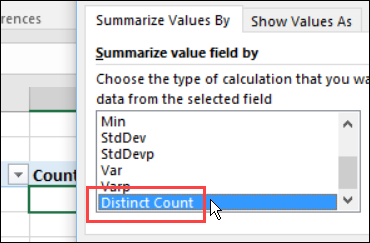 There isn't a built-in "Unique Count" feature in a normal pivot table, but in this tutorial, you'll see how to get a unique count of items in a pivot table. In Excel 2010, and later versions, use a technique that "Pivot the Pivot table". Or, in older versions, add a new column to the source data, and Use CountIf. Often we have large data sets that we want to analyse with the aid of a Pivot Table, but we only want to count the unique occurrences of some items of data. Unfortunately, Pivot Tables have never had the inbuilt facility to count unique values. In this example, the sample file has 4999 records that show product sales, with the region and salesperson name. The first few records are shown in the screen shot below. You can download the sample file at the link below. 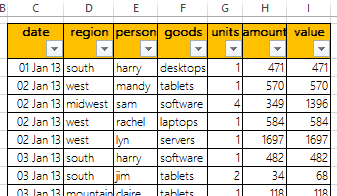 Creating a Pivot Table from the data would give us something like the following, if we added Person to the Values area of the Pivot table and summarised it with Count. However, this is giving us a count of all the transactions, not the count of the unique number of people who made those transactions within each Region. 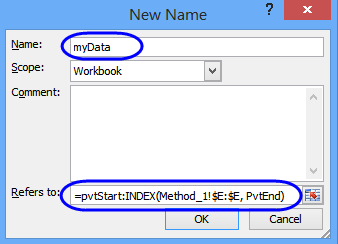 Method 1: In Excel 2013 and later, add the pivot table's source data to the Data Model, and a unique count can be done easily. 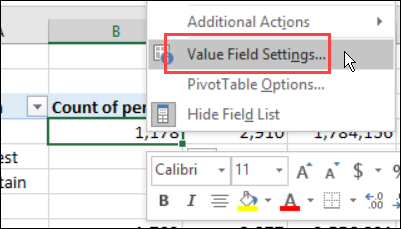 Method 2: In Excel 2010 and later, use the "pivot a pivot" technique. 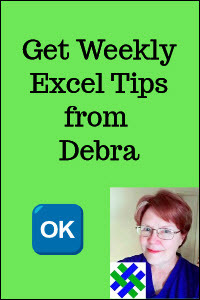 Method 3: In older versions of Excel, add a column to the source data to place a 1 in cells on a row where the value is unique, and a 0 in any other cells. Then, summing this additional column provides the unique value. All three methods are described below, along with a performance comparison between methods 2 and 3. 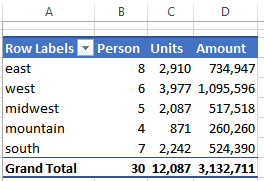 In Excel 2013, if you add a pivot table's source data to the workbook's Data Model, it is easy to create a unique count. NOTE: This technique creates an OLAP-based pivot table, which has some limitations, such as no ability to add calculated fields or calculated items. If you need the restricted features, try the "pivot a pivot" method instead. Select a cell in the source data table. 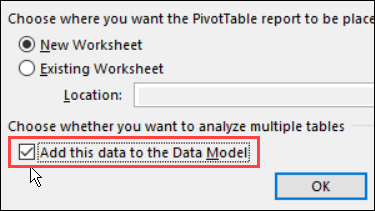 At the bottom of the Create PivotTable dialog box, add a check mark to "Add this data to the Data Model"
In the pivot table, add Region to the Row area. The Person field changes, and instead of showing the total count of transactions, it shows a distinct count of salespeople's names. 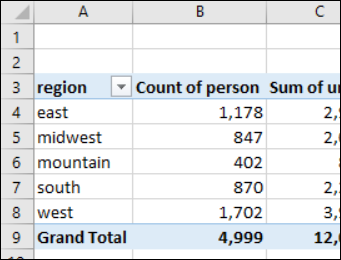 To get a unique count of salespeople per region in Excel 2010, we can produce a Pivot Report, and then "Pivot the Pivot" to get our final result. 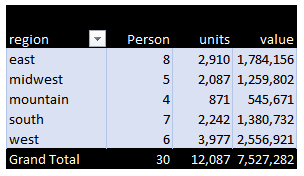 Add Units and Value in the Values area. 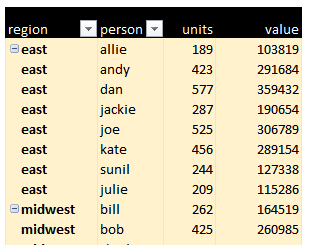 Because Person is a text field, the Pivot table will automatically show it as "Count of". Set all the Item labels to repeat in each row. Change the Captions, to remove the "Sum of"
TIP: Type the original field name, with a space character at the end, e.g. "units "
This now looks like a normal table of data, but it is a summary of the original full data table with 4,999 rows. Next, you'll name the first cell in the pivot table. The next step is to calculate the location of the last row in the pivot table. We'll use the MATCH function, with a very large number, to find the last number in column D, and get its row number. This formula will only work in a column with numbers. To name that cell, select cell M2, and in the Name Box, type PvtEnd, and press Enter. Next, we will create a dynamic Named Range, to refer to this new table. This range will start in the cell named pvtstart (the Region heading cell), and end in the last row of data in column E (the named range, PvtEnd). Finally, create a second Pivot Table, based upon the dynamic range, myData. This shows the number of unique salespeople per regions as shown below. For example, in the first pivot table, the East region showed 8 unique names in the person column, and that is the count in this pivot table. 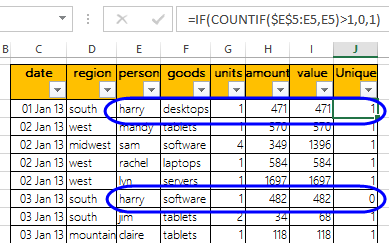 Naturally, as there are 2 Pivot Tables involved in this solution, both have to be refreshed after any data has been added or changed in the source table. It is essential that the first PT is refreshed first, followed by a Refresh of the Final Pivot Table. You can refresh the pivot tables manually, or use amacro. 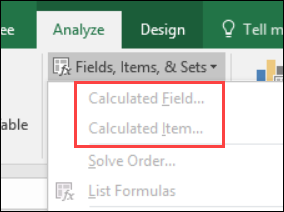 To use a macro, add one of the following procedures to the sheet with your final Pivot Table. If you are using macros to refresh the pivot tables, you could also use a macro to reset the myData named range after each refresh. Add the following procedure to your workbook, then call this SetmyData procedure in the Worksheet_Activate procedures. You can download the sample file at the link below. The first reference in the range ($E$5) is Absolute, and the second is relative (E5), so as we copy the formula down the page, so the range will expand from $E$5:E5 to $E$5:E6, then $E$5:E7 and so on. In each row we are checking how many times the value in column E (Person) has occurred, down to the current row. If it is greater than once, the result is zero, so that person is not counted again. This lets us see the number of unique times within the dataset that each Person's name has appeared. With the extra column added, the data would look like this. The second instance of "Harry" returns a zero in the Unique column. 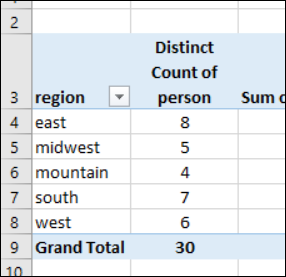 In Excel 2003 or earlier, concatenate the Region and Person names in a new column, and then use the COUNTIF formula to find Unique values in that concatenated column. Add Unique, Units and Value in the Values area. 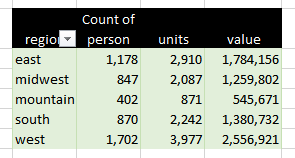 Change the "Unique" heading to "Count of Person" or "Person "
We can see that there are 30 people who made the Sales, and the number of each who are in each Region, and if we chose to expand any Region then we would see the individual totals for each Person. If possible, use the "pivot a pivot" method, which is much faster. Using a COUNTIF formula in the source data works, and gives us our desired result, and on a relative small dataset the method is acceptable. But, it is very costly in terms of processing time, and on very large datasets can be extremely slow. Using Charles Williams' "FastExcel" to calculate the time it takes for the workbook to calculate gives the result shown below, where the time taken to recalculate the Data sheet is 224 milliseconds. The "Pivot a Pivot" method also produced the correct result, with a unique count of Person, as required. In addition, it does not rely upon additional columns in the source data, nor entering of any new formulae. With small datasets timing of recalculation may not be critical, but when dealing with larger datasets of 300,000 to 400,000 rows, then these differences would become very material. Download the sample workbook, which contains examples for Method 2 (pivot a pivot) and Method 3 (column in source data). The file is zipped, and in xlsb format. The file does not contain macros.